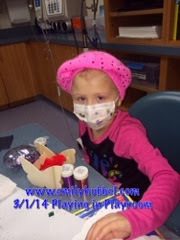 Overnight Emily continued to have high blood pressures but thankfully no fevers. Blood draws at 5 in the morning tend to be rough as well because her port has been very positional so drawing blood has been tough! So the past two nights she has had to come back and draw again each time waking Emily and trying to get her to move around to get the blood draw! Platelets didn't go up much today either 23 only to 26! She was given 2 units yesterday so they decided to give her a full 4 units today. Her body since that anaphylactic reaction has been eating up the platelets. WBC .4 so she is starting to go up, just really taking a while. They did say the CMV virus they were checking for came back negative but the other one has not come back yet! Today has been a rough day. Actually it's been a rough week, we all just need a vacation away from work and everything, ugh something would be nice. Dad slept today after not sleeping all day yesterday and of course night from working, I hated that when he called after waking up to give him the update of the day. Never fun to wake up and hear the news that Emily has had a rough day and all that has been happening. Then being frustrated with the doctor on too much medicines so going from one extreme to the other, was hard! Thank you to Sue for bringing Brianna up for the day and getting breakfast and lunch. Poor Brianna hasn't had anything stable with Emily being in the hospital and having a hard time with dad going to work, and where she will be for the night! She was really good today and nice to have her here hanging with us. Tonight Nanny also came for a visit and then daddy got here with toys for both of the girls. Thank you nanny for taking Bri for the night and thank you sue and Jojo for holding down the fort. I feel so bad that we couldn't have any down time to visit and see Jojo and wish we could just take some time off and go spend time with them. Emily hasn't seem to have had anymore loose bloody (and they were not just tinged but all red and obviously blood) so we are thinking she had some kind of gi thing going on or tear that couldn't clot because her platelets were so low and then has not had anymore since she received platelets! I know we were concerned with hemoglobin dropping again but they did a stat hemoglobin check and it was from 10 to 9. For the past 24 hours Emily is starting to eat better, so thank you dad for making sure she had her Mac and cheese because she has been eating that and chicken noodle soup like crazy! Tonight about 1110pm we finally got the IVIG going. The hope is that whatever antibody or whatever that is eating up the platelets the IVIG will help it. The biggest concern with IVIG is blood pressure so it Is being checked what seems like every 15 minutes. They bump it if she can tolerate it but they are only bumping it at halves to not overwhelm her body! At first her blood pressure went up in first 15 minutes but has gone down within next half hour! So so far she is tolerating and for that I am happy! Emily is very agitated with people, doctors, noises and just anything out of the normal. I feel so bad, dad and I both do because of how she is feeling! Everything she is going rough and putting her through more hell when this was supposed to be less! The plan is to get this done with no high or low blood pressure because if goes " low we may have to either do fluids and if it goes high will have to do meds. It will probably be about 10-15 hours to complete so I am not sure when the blood draw will be completed to check counts and everything else and we are not sure on discharge. I know that Dr Low is to come back in the morning and review Emily and see what is going on. She will determine if she will need to go home on blood pressure meds tomorrow and review kidney ultra sounds. But for us, We just want to make sure she is safe when she heads home and not worry about blood pressures and anything else. If discharge tomorrow, we will have clinic on Monday morning to get blood counts and check in with Nephrologist! Please continue to keep Emily in your thoughts and love. We are all completely exhausted and want to be home. I'm so tired tonight and won't be sleeping much to keep an eye on her.